I suddenly have free time in the evenings again, so I took a few photos to share, and update everyone on the (riveting, I know) status of my various knits-in-progress. Finally photos of the Roza Socks! I love them. Haven’t worn them yet, as it hasn’t quite been wool sock weather (for which I am very thankful). While I was knitting, I kept thinking that the greens were very similar. Once they’re together I realise they aren’t, but I just had to show these shoes. I love these shoes. They’re springy and pointy and that wonderful shade of green. A photo with a couple notes and the wonderful gaping-ribbing-thing fixed is here. Progress on my Dollar and a Half cardi. The sleeve was a sort of uber-swatch. I blocked it when done, just to make sure the sizing would be all right. 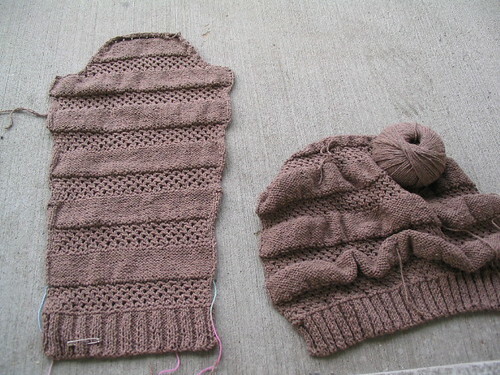 It’ll make a sweater that is between the two smallest sizes in the magazine, which is just right for me. You can see the lifeline I put in, in case I had to rip back. Any excuse for less ribbing. You can see the difference in the blocked vs. unblocked fabric. The big wobbly thing is about half of the back. 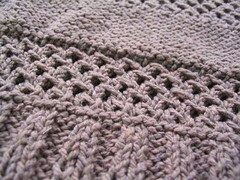 There are 4 lace stripes on it at the moment, so if you look at the sleeve, you can see how much length is all squashed up in there, waiting to be blocked. I think I may end up pining this out. 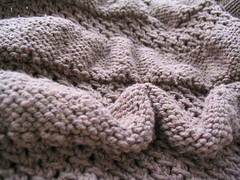 When I blocked the sleeve, I soaked it, then just patted it out on a towel. It got rid of most of the Michellin-man effect, but not all. Either that or an iron? But ironing a knit sounds wrong. In other news, it is gorgeous outside, and I’m freezing in an over-air-conditioned office. There was a natural gas leak this earlier this morning apparently, and while it is safe to be in here now, there is still a lingering smell. We’ve been told to turn the heat right down so the AC comes on, which will bring in fresh air. brr. Earlier in the year I said I was going to knit from my stash. I did. Then I got bored with said stash, so I ordered yarn. My yarn km count is now ebarassingly high, but all that new yarn is for specific projects, and the list of projects will last me quite a while, even with this knit-friendly job, so I’m happy. Some time in March (the last time I updated my stash tracking spreadsheet) I had about 6.2km of yarn. Now I have, well, almost double that. But it isn’t like I’m broke or can’t pay the bills or anything (thank you, job), and I won’t need yarn for at least another year, probably two. 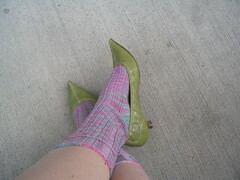 This entry was posted in Knitting, Socks, Sweaters and tagged dollar and a half, rozas socks by rycrafty. Bookmark the permalink. The Rosa socks look great! And you seem to be coming right along on the cardi, too. Haha- I say the exact same thing about how long my stash should technically last me.. and then I always find some other yarn to buy for some exciting new project! Good luck whittling away at your 6.2km of yarn! Those socks are lovely and I LOVE THOSE SHOES! Your Roza socks are awesome!